Well then, that was quite a week on all sorts of levels. I shall refrain from mentioning anything political in this post as it makes references to mundane everyday stuff, well err mundane and perhaps a little irrelevant. So here goes, it feels like a lot longer than seven days since my last Sunday Sevens, but it’s not. Who knew this time last week what was about to happen? 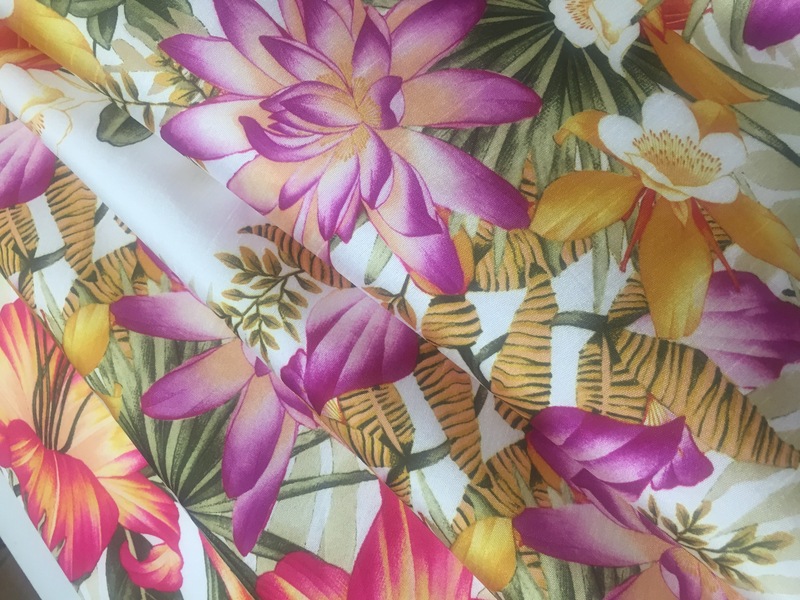 Sunday Sevens is a weekly blog series devised by Natalie at Threads & Bobbins. 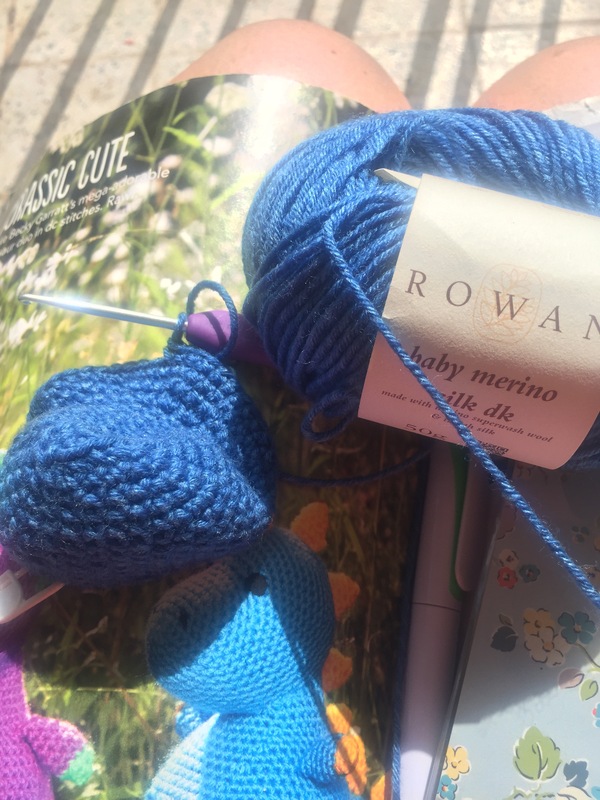 If you fancy joining in, pop over to her blog and find out how to have a go. Last Sunday was Father’s Day in the UK and I spent it in England with my lovely Dad for the first time in years. My little Postcards took good care of their Dad when I was away and I think they really enjoyed their time with just Daddy. My Sunday was completely different from the usual routine. I wasn’t woken early with the pitter patter of small feet coming into the bedroom to ask for a cuddle/juice/breakfast/the TV remote. I had a lie-in (bliss) and after breakfast we jumped into the car and headed out into the Cheshire countryside to the fabulous Black Sheep Wools at Culcheth in Warrington. 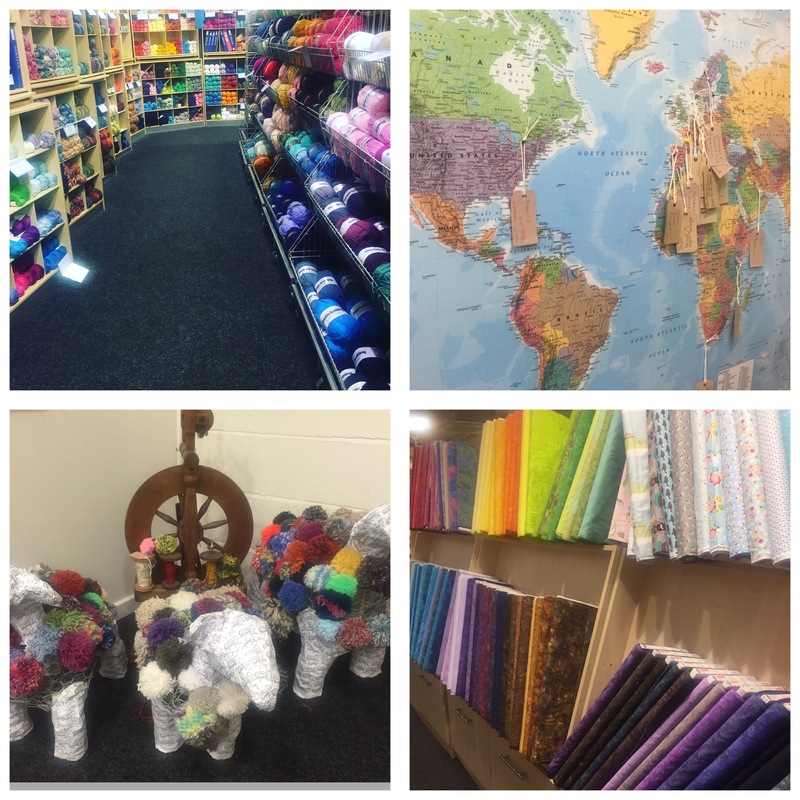 It was wonderful to be surrounded with all this wool of every colour imaginable, there were fantastic books, fabric, sewing kits and all sorts of crafty delights. I was in heaven. We stopped for a tasty lunch in the cafe there aptly named ‘Tea Bags Full’ and before heading to our next destination I made use of the facilities. On the way to the loo, I spotted these cute pompom sheep (above) and a fascinating series of maps on the wall. The maps were of the British Isles and also the world. People had written their names and where they were visiting from on tags. It was such a good idea as it showed how far their customers had travelled from. In the scheme of things Gibraltar wasn’t that far. South Africa and New Zealand featured tags from customers as well as many other exotic destinations. There were no spare tags for me to write on and say I was visiting from Gibraltar so this is my tag. Hello Black Sheep Wools, my crafty stash grew quite a bit thanks to you. I hope to be back again one day! 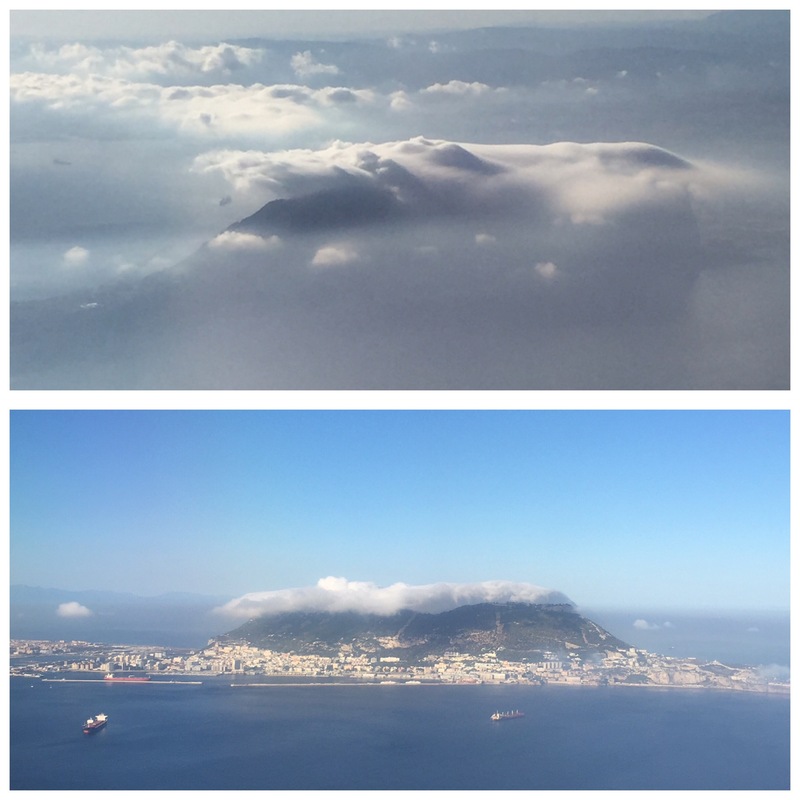 Monday meant time to head back home to Gibraltar. I had a really great time with my parents and was also able to see my little brother and his lovely fiancee. My weekend away flew by so quickly that I was on my way back to the airport before I knew it. On the flight I was blessed with a window seat on the right hand side which gave me a wonderful view as we circled the Rock. As we approached along the Spanish Mediterranean coast from Malaga, Gibraltar was shrouded in cloud caused by the levanter winds. Moments later, after we came around the southern tip of Europa Point I got this great view of the Rock with it’s cloudy hat on. It’s amazing to think that these two pictures were taken just moments apart. Meet Wonkysaurus. 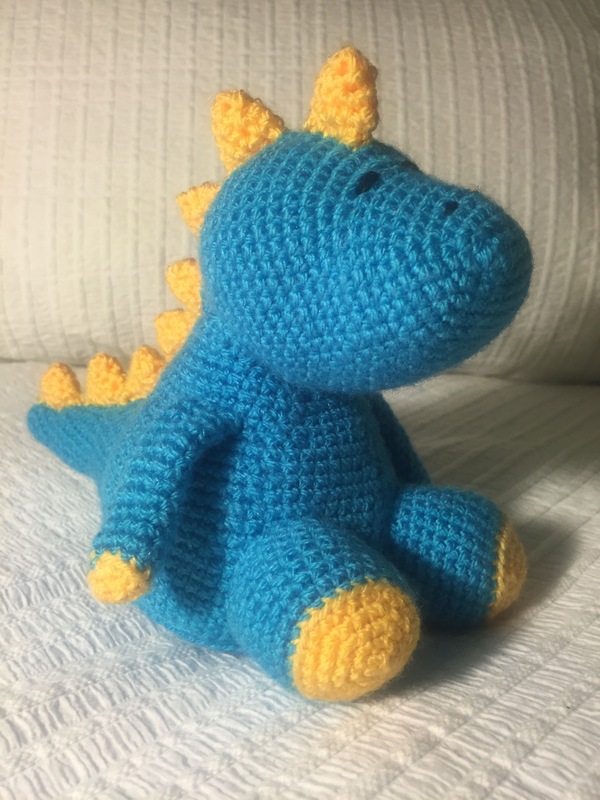 He’s my fourth dinosaur crocheted from a pattern in Simply Crochet magazine. I do rather like him, he’s got slightly wonky spikes, hence the name. This week he went to his new home to meet his new owner. I’m not sure what his new owner makes of him yet (he’s just 4 weeks old) but his Mummy approves. Saturday saw the annual Convent Garden Open Day in Gibraltar. It’s a regular event on the Gibraltar social calendar and gives us mere mortals the chance to wander round the Govenor’s back garden. 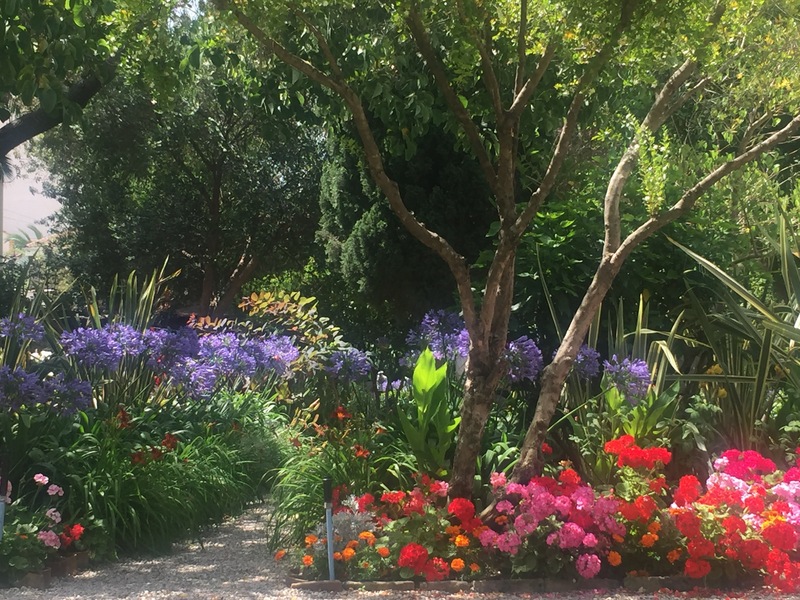 The planting is gorgeous and a riot of colour beneath the lovely shade giving trees – many of which were planted by visiting Royals in years gone by. It was hot hot hot so that shade was very welcome. I’ll share a few more photos of this soon. I’m amazed to be saying this but yesterday Postcard from Gibraltar had it’s first birthday. I can’t believe a whole year has gone by since I made my first post. It’s been such fun. I have come into contact with so many lovely, encouraging people during the past 12 months both online and in person. Thank you to all of my new friends as well as my old friends and family who have supported my fledgling blogging adventure so far. Here’s to the next 12 months! Now it’s time for cake don’t you think? Happy blog birthday. Glad you had a great visit home. Did your Dad enjoy the wool shop? Love your picture of the Rock. Happy Blog Birthday!!! Your photos and posts are so much fun to follow. Now go have some cake!! This has made me want to go wool and fabric shopping! Congratulations on your first year of blogging! What a lovely post… the view from the plane is delightful. Sounds as if you had a wonderful weekend away with family! the gardens are stunning, so beautiful. Thank you! My visit back home was really lovely 🙂 I have to agree with you on the gardens – such an oasis in a very built up part of the world!